The Arundale Emerald Green Sky Cafe Bird Feeder is the best squirrel proof bird feeder in the world. Referenced very highly in Bird Watcher's Digest and Bill Adler, Jr.'s book. Squirrels slide off the dome every time they try, and they do keep trying, again and again. Cardinals, chickadees, tufted titmice, woodpeckers and many other songbirds gather on this circular, full-view patio. Cardinals, who are a bit shy about landing on narrow spots are eager to land on this popular platform. 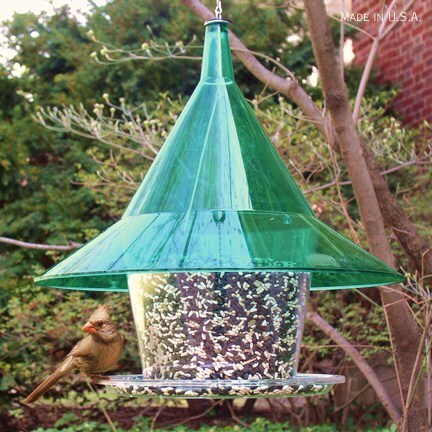 The huge 17" diameter squirrel-proof dome protects seed from rain and snow, too. Customers are very loyal to this feeder. Its large capacity 1 1/2" gallon bucket means fewer trips to refill. Clear-view, easy-flow seed dispensing means birds peck at a seed and it falls out in front of them onto the tray for easy dining. The durable Plexiglas lasts for years and years. NOTE:Comes with 2 ' hanging chain and is pole mountable. (Cord and cord lock sold separately for easy pole mounting for 1 inch outer diameter pole.